You asked for it! You got it! The Google Classroom Team delivers again! Co-teacher support? Check! Create Assignment and Announcement drafts? Check! Enter grades in advance? Check! Oh, and you now get email notifications for private comments, too! Check all the new features just released! Keep reading! This was one of the most frequently requested features since the inception of Google Classroom, and it's finally here! 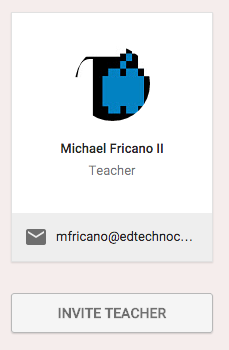 As a teacher, once you create a class you now have the option to add other teachers to your class from the About page. You invite teachers to your class the same way you would invite students. And you can invite more than one teacher! 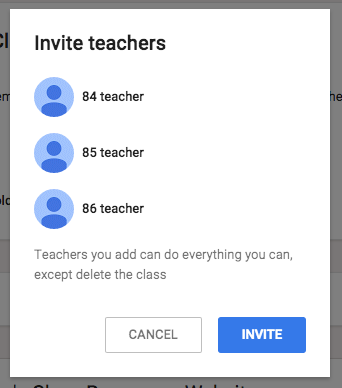 Any teacher you invite can do everything that you can, except delete the class. All accepted teachers in the class will be displayed in the top banner and along the side of the About page. along the side of the About page. Create draft Assignments & Announcements! The ability to "hold" Assignments and Announcements has also been a popular request. Teachers love to plan in advance, and especially want to be able to release Assignments at the push of a button. This new feature always the teacher(s) in the class to save drafts of Assignments and Announcements. You can create the entire Assignment, along with the due date and attachments, then choose Save Draft from the list in the corner. It will then be listed in a new box on the stream called Draft. You can go back to a draft at a later time, open it and then post it when you are ready. You currently can't schedule it to be posted at a later time. ADDED BONUS: Your Assignment or Announcement will actually save as a draft automatically as your working on it! Next to the blue Assign button is a new drop down menu with the options to Assign or Save draft. Once you save a draft, it will be listed in the Draft menu on the stream. Your Assignment or Announcement will automagically save as a draft as you work on it! You don't even have to click on Save draft. Assign Grades Without Having to Return Assignment! Another great new feature is the ability to assign grades, without be required to Return the assignment to the student. Saved grades are not yet shown to the students. Students will only see their grade when you have Returned the assignment. Email Notifications for Private Comments! Now when the teacher(s) and the students use the private comment thread in an Assignment, both will receive email notifications (if that featured is turned on in the settings). The email will contain the Assignment name, the actual comment, and a link back to the Assignment page. Here is an example of an email notification for a private comment. Submit Your Google Classroom Feedback! 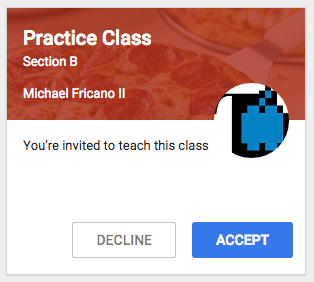 The Google Classroom Team values their users. They read every single piece of feedback they receive and respond accordingly. They are listening! 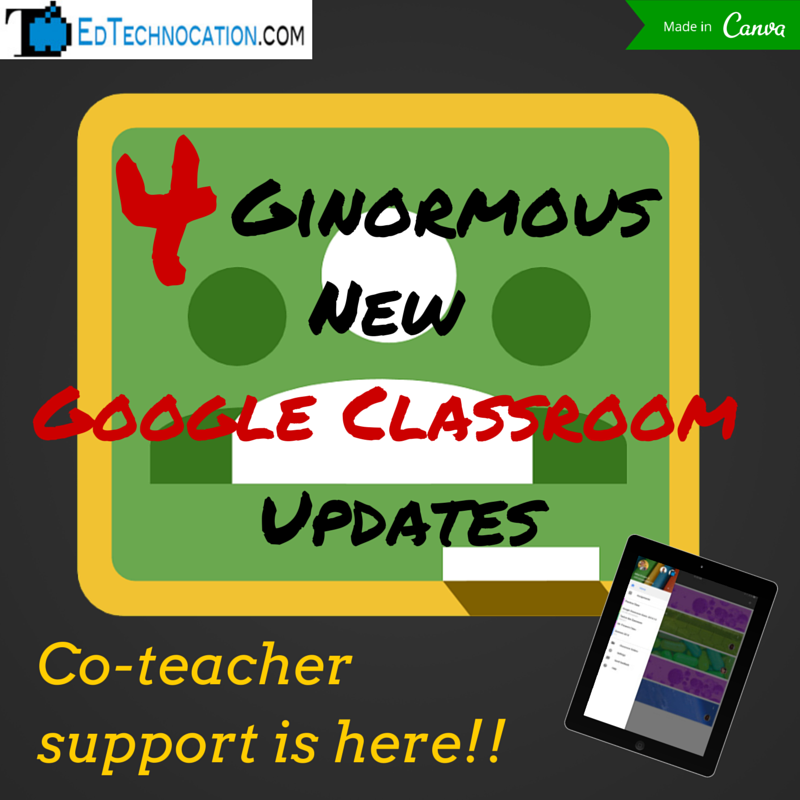 If you think of a feature that Google Classroom desperately needs, Send Feedback! Click the "?" 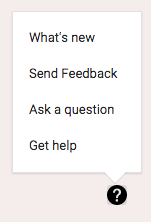 in the bottom right corner of Classroom and choose "Send Feedback".